Beautiful, showy rosy-pink flowers have a contrasting crimson eye and yellow center. Heavy blooming, 4-5 foot tall plants. Cosmos (Cosmos Bipinnatus Sensation Gloria) - Cosmos is one of the easiest flower seeds to grow, and it is just as easy to maintain! These gorgeous annuals thrive with neglect, and they are perfect for the weekend gardener. Cosmos Bipinnatus Gloria has large, 4 inch blooms of rosy-pink with a crimson and yellow eye. They are incredibly beautiful when planted in mass. A sunny location and moderate water is all that Cosmos need to perform well. Don't even apply fertilizer as it tends to produce unusually tall, lanky plants with few blooms. Originally, Cosmos came from wildflowers, of course, and are native to our own southwest and more commonly, Mexico. These annuals also go by the name of Mexican Aster. Cosmos Mexican Aster does well in hot, desert type areas, but they easily adapt to many conditions and thrive. Cosmos are known as an excellent cut flower with a vase life of 7 - 10 days. Cut the blooms in the early morning hours, and select stems with flowers that have just opened. Remove the leaves below the water line, and enjoy a beautiful bouquet! Directly sow Cosmos Mexican Aster flower seeds into prepared seed beds after danger of frost has passed. Sow the Cosmos flower seeds in rows, 18 inches apart. Sow 6 seeds per foot. 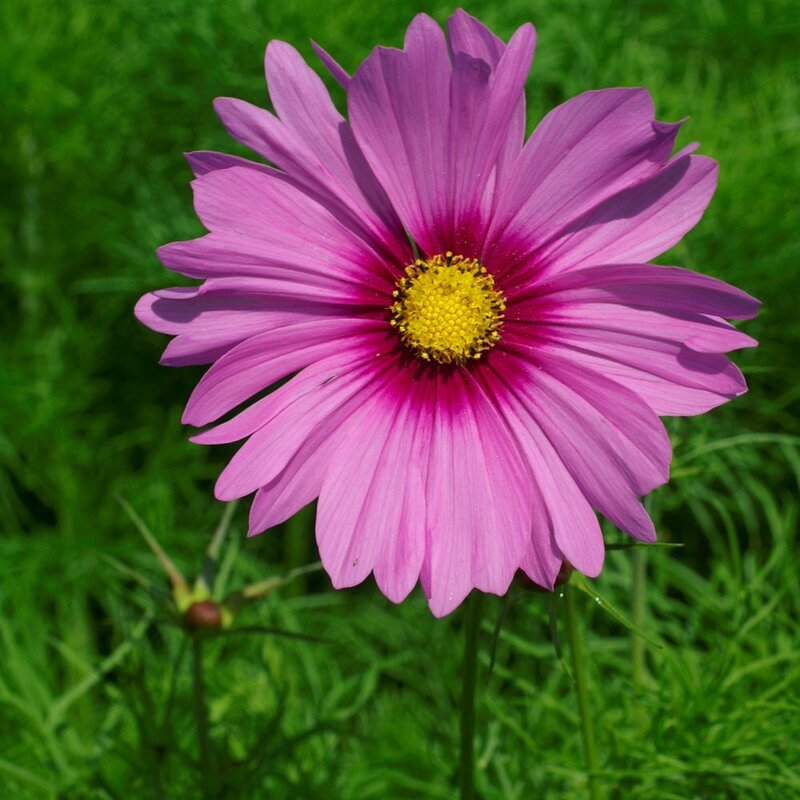 Lightly cover Cosmos seeds with 1/16 inch of soil. Keep flower seeds moist. Thin to strongest plant 12 inches apart. Or, if you're not into measurements, Cosmos flower seeds can be scattered onto the prepared soil. Lightly rake the soil over the Cosmos seeds at a depth of 1/16 inch. Keep the Cosmos flower seed moist until germination. They perform well even when crowded. ‘Sensation Mix’ – 3-5 feet tall in shades of white, pink, rose and crimson. Dwarf Cosmos – 2-3 feet tall in shades of white, pink, rose and crimson. · We accept payments through PayPal only. If you are purchasing multiple items and wish to take advantage of our combined shipping rates, place each item in your eBay shopping cart by completing the "Buy It Now">"Commit to Buy" purchase, but do not pay until you are finished shopping. Here's is what to do to get combine shipping ,Go to the items your want to buy ,Click “buy-it-now” on each of them ,Next do not pay for them , go to your My EBay, Next go to your ,Bought History, and you'll see all the items you just click on, and at the top of them you will see " REQUEST TOTAL FROM SELLER" Click on that and We'll fix all your Combine shipping ! If checkout makes a mistake figuring combined shipping, I will refund the amount. · If the tracking information showing that your item has been delivered and you did not receive your order, please go to your local USPS (Post Office) and take your tracking # information with you. Shipping to: United States, Canada, United Kingdom, Denmark, Romania, Slovakia, Bulgaria, Czech Republic, Finland, Hungary, Latvia, Lithuania, Malta, Estonia, Australia, Greece, Portugal, Cyprus, Slovenia, Japan, China, Sweden, Korea, South, Indonesia, Taiwan, South Africa, Thailand, Belgium, France, Hong Kong, Ireland, Netherlands, Poland, Spain, Italy, Germany, Austria, Israel, Mexico, New Zealand, and Singapore.